As we level out onto the Zumwalt, the Findley Buttes, three shield volcano cones that managed to force their way up through the Columbia River Basalts, rise before us and dominate the landscape. 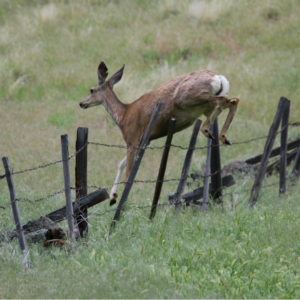 On their flanks are small fenced-in restarts of quaking aspen and hawthorn groves, an attempt to repopulate these prairie associates after overgrazing from elk herds that have more recently been using the prairies as opposed to the forested areas in the Blue Mountains to the north. My companions for the day are Mike Hansen, the assistant district wildlife biologist for Wallowa from the Oregon Department of Fish and Wildlife and outdoor writer and television host Scott Haugen. 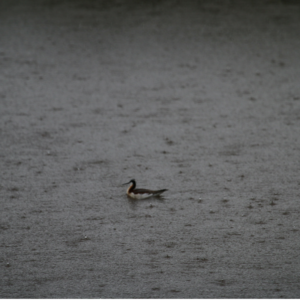 As the rain picks up in earnest, we drive slowly, trying to first eyeball and then glass the waterfowl in the dammed-up ponds created for grazing cattle. Our conversation starts at the beginning of time, when elemental forces crashed a bunch of plated islands together and pushed up mountain ranges higher than the Himalaya, which would eventually succumb to other elemental forces and erode down, only to be pushed up again some eight million years ago and then filled up with Columbia River basalts and then ground down or gouged out through glaciation events and glacial floods. 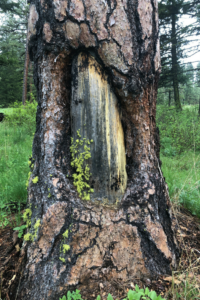 Left behind were the steep granite walls of the Wallowa Mountains, the flood-water blasted and widened Hell’s Canyon and several wind -carved plateaus which later filled with the loess the way dust gathers in the corners of your house. It’s difficult not to imagine the enormity of the forces that made this landscape when you look at it. Like the face of a weathered, old rancher; each line, each ridge is filled with geological history, most of it lost to time. 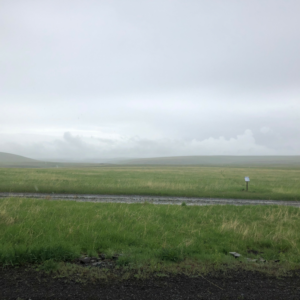 Mike and I talk about the aspects that saved the 330,000 acres of Zumwalt prairie, the last, largest native grassland in the Pacific Northwest, and one of the largest remaining intact pieces of prairie in the country, from the same agricultural fate of other grasslands in the region. In a word, it’s inhospitable. Too harsh and cold in the winter, too many early frosts, little to no protection from howling winds. Luck. Other more hospitable areas were located just over the horizon, and today they’re covered in alfalfa. 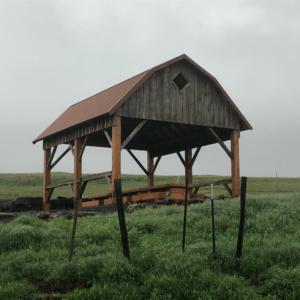 The rain pounds the prairie as we gain elevation. At some point we drive straight into the ceiling, and everything is gray, the grandness of the prairie is lost to the elements that created it. 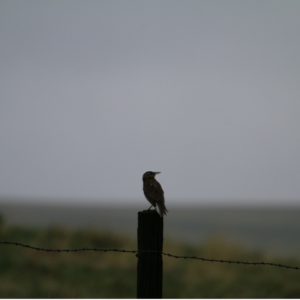 We pass a very sodden and miserable looking Meadowlark sitting on a fence post, but most of the wildlife is hidden away in whatever nook or cranny they can find. Without a horizon or even a discernible landscape, I’m left to imagine what the prairie looks like on a sunny day based on photos and the words of Marcy Houle’s “The Prairie Keepers,” a book which had far more influence on the way I see the world than I ever would’ve thought when I read it for an environmental literature class in college many years ago. At a fork in the road between two of the three Findley Buttes, we decide to proceed on to Buckthorn lookout on the off-chance the weather blows over. At the top of the prairie, the elk herds are spread out and grazing in the rain. Somehow they still look regal in spite of the gray curtains shrouding their otherwise telltale light brown, brown and dark brown forms. At Buckthorn we do not see down into the Imaha Country, the backside of Hells Canyon. Only little pieces of dark green show up through the mists and clouds. We don’t see the bighorn sheep perched on cliffsides with newborn lambs learning to walk on places never meant for walking. 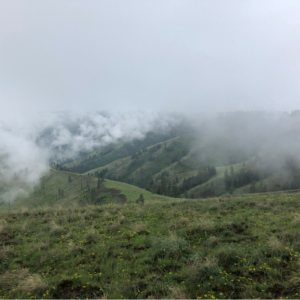 We make our way back into the storm that sits atop the prairie and head for the Findley Buttes again, this time taking a left and descending the prairie via the Old Imnaha Road, which parallels Trail Creek as it scours out a small canyon of its own. At some point we leave the rain behind, and a little sunlight spills into the canyon, and the birds come back to life. 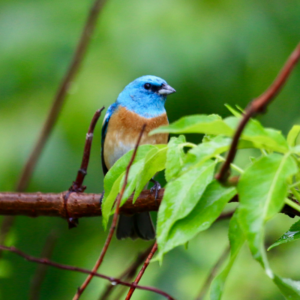 During one short stop, Mike Hansen’s experienced ears catch the tune of a Lazuli Bunting, the eccentric blue-bonneted bird that adorns the cover of Sibley’s birding guides. 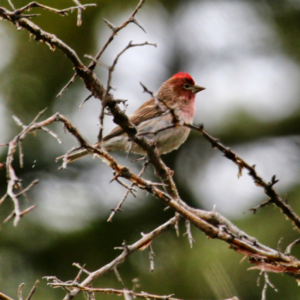 Parked in the middle of Old Imnaha Road with cameras perched on the windows of our car, we wait to catch sight of the little, colorful bird. We stretch in unimaginable ways, contorting our bodies to catch a frame or two, before the bird disappears back into the riparian area along Trail Creek. 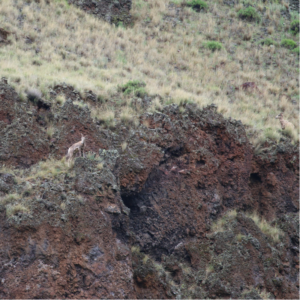 Further up ahead, high in the exposed rockfaces of the Columbia River Basalt, we see a young bighorn sheep ram surveying his domain. His mother and another ewe keep a watchful eye above him. Down lower in the draws we hear then see wild turkey toms unable to stop themselves from gobbling back at our slightly pathetic hen calls. Because the rain shortened our day on the Zumwalt, we decide to take our lunch break at Five-Mile Lookout, high above Imnaha. While the sounds of chukar working their way back up the hillside drift up to us, a ruby crowned kinglet watches us warily from its perch a few feet away. I scan the countryside around me and see much further back than I would normally. I see millions of years of time spread out in front of me. Cataclysmic lava flows, glacial floods, old reefs and ancient shorelines. Our arguments about land use are silly when you can see this far back in time. What our neighbors did with the land a few years before we arrived is irrelevant. What the land looked like 150 years ago is irrelevant. What its natural state is, is really irrelevant. Because the land is always changing, always rising and falling, filling up and eroding, subducting and uplifting. It’s noble to want to keep something intact. But it has to be acknowledged that it’s just one short-lived lifespan in the grand scheme of time. That it wasn’t always and won’t always be. 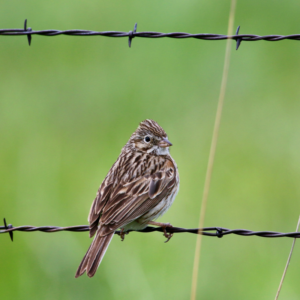 But the biodiversity of the prairie is important. the time-frame that it represents has been overwritten by human progress and Western expansion. The hundred species of bees associated with the wildflowers that only bloom in number on this prairie are important to record, to study, to understand our impact. The great movements of animals over time coincide with settlement, agriculture, industry, economics and human encroachment into these once wild areas. And human encroachment goes back at least 10,000 years and maybe more, but the numbers increased rapidly in the last seventy years. And that can leave a mark. 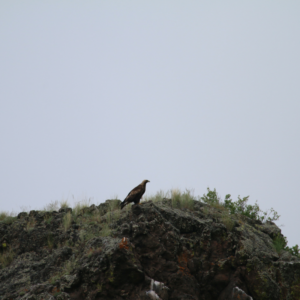 Mike Hansen points out more raptors for us as we head back to Enterprise. I want to say I saw them on the Zumwalt Prairie, and he says I can, that this fishing hole where we are watching four species of swallows dart around is technically on the Zumwalt, just a lower, more agricultural, part. 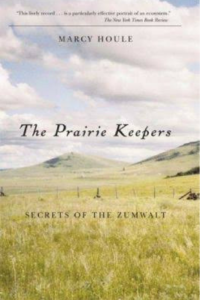 I think back through what I remember of “The Prairie Keepers,” which looked at post-settlement impacts on the prairie, and I can’t help but wonder what it must have looked like when it was all freshly carved out by the winds and rains and thousands of snowfalls. 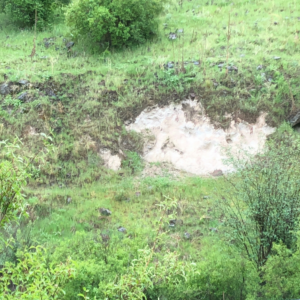 When the dust, at first, began to arrive from the north and settle into protected crevices where it deepened into dirt, where the first plants began to grow there, attracting the first animals to stay there, which caught the attention of the raptors cruising above. As we depart for La Grande and other activities, I look in my rearview mirror at the still enshrouded Zumwalt behind us and look forward to walking out into those bunch grasses on some sunny day in the future.